Pinot Noir is one the classic grape varieties and the one most associated with high-end red wine. It has a reputation as being a notoriously difficult grape to grow. For this reason top Pinto Noir wines tend to be associated with particularly good harvests in France. However both Australia and New Zealand have developed a grasp on growing Pinot Noir consistency, leading, in part, to a break in the dominance of French wines in the quality market. The Pinot Noir grape produces rich, fruity flavours of blackcurrant and cherry. Pinot Noir is light in colour: Pinot Noir wines from Burgundy lend themselves to the association of a deep but light red colour with the name ‘Burgundy’. After tastes are often complex, including oak, spices, and a touch of the ‘barnyard’! A good vintage carries a velvety palate. Pinot Noir is also one of three grapes used in the production of Champagne. 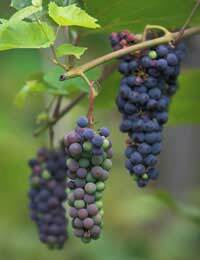 The exact origins of the Pinot Noir grape are unknown. Some argue for it to be a variety closely connected to the original wildly grown Vitis Vinifera, which would make it one of the world’s first cultivated wine grapes. Pinot Noir is thought to have arrived in Burgundy in the First Century A.D. The successful development of the grape is attributed to farming monks, who cultivated each vineyard appropriately to suit both the grape and the climate. In truth, there are too many troubles with Pinot Noir to mention right here. Put simply, genetic mutations, an aversion to frost and a propensity to catch every vine disease going make this grape a wine producer’s nightmare. However, given a chalky, well drained soil and randomly good year, Pinot Noir produces some of the best high quality wines. Burgundy has such a climate, with ideally sloping vineyards that allow for the best and the worst of the summer heat. Pinot Noir is grown in France, Italy, Spain Germany and even England (where a Chapel Down Pinot Noir recently won a bronze medal in an International wine competition). It is also grown in Central Europe, New Zealand, Australia, Canada, the U.S.A and Brazil, amongst others. Its proliferation throughout the world is tribute to the excellent wines it can produce when there is a good harvest. This is particularly true as it is a tricky grape to ‘get right’. Most other temperamental grapes have enjoyed such wide popularity or distribution. Pinot Noir from Burgundy will generally be referred to simply as Burgundy or ‘Bourgogne’ locally. If it is made from grapes harvested from a particular village, vineyard or estate, its name will be stated on the bottle. Sometimes the bottle will carry the name of the estate only. In this sense, knowing what you are buying requires a good knowledge of the Burgundy region. Elsewhere, Pinot Noir will often be referred to as ‘Pinot Noir’, in keeping with the new world tendency to market grapes rather than estates. Coq Au Vin is traditionally made with Pinot Noir – try a medium quality one for this, poor quality will taint the food, good quality will be wasted. Pinot Noir is said to be a good accompaniment for duck and grilled salmon. Good cheeses to match Pinot Noir include Bleu d’ D’auvergne and Gruyere.